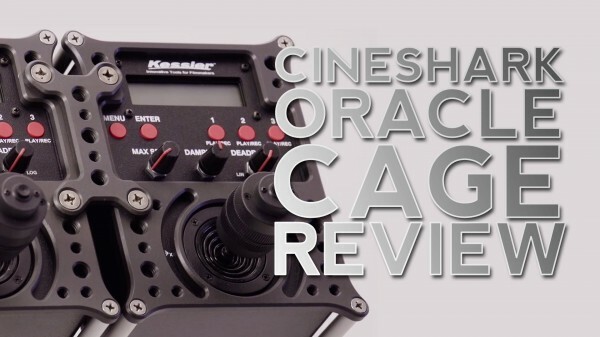 In this review we take a look at the new Oracle controller cage from CineShark. This cage keeps your Kessler Crane Oracle controller safe a protected from the demands of productions, plus it adds lots of mounting options for accessories. The Oracle controller is used to control Kessler’s Revolution remote pan/tilt head system along with their electraDrive slider motors. It is a great controller but can be a little delicate due to the plastic design. CineShark has created a way to keep the controller, which is a $1000 piece of equipment, safe and protected from drops and other forms of abuse. As long as you don’t drop it in a river, you should be comfortable knowing that your Oracle controller is protected. We often have a variety of grips on our shoots at Creative Edge Productions and some can be a bit more novice than others. Prepping our 12′ Kessler Crane is a task they will often undertake and accidents can happen. Knowing that my Oracle controller is a bit safer is a nice feeling to have. The variety of mounting points means I can attach a monitor, articulating arm or other accessories directly to the cage. This can help save space especially on the back of a jib, plus it allows me to attach additional mounts to the back of the controller. The price isn’t too bad either. Considering you’ve already spent $1000 on the Oracle controller, an extra $95 to keep it safe is an easy purchase to me. In summary, this is a no-brainer for anyone who owns an Oracle controller. Pick one up and enjoy the piece of mind. Can we get a review of the Kessler product you have please?